I do not envy the task facing Puerto Rico’s Oversight Board. It was set up for an island stuck in permanent economic decline facing never-ending budget crises. A large tax hike—the sales tax was raised by 4.5 percentage points (to a rate of 11.5 percent) in 2015—had failed to stabilize Puerto Rico’s finances. At least the finances of the central government (the “general fund”). Revenue shortfalls were covered by selling the pension’s assets, and by deferring payment of tax refunds and other bills until enough revenue was found. And there was no real hope that things would get better. The Obamacare funds that covered a decent chunk of Puerto Rico's health care spending were set to run out. The pension system’s assets were about gone. The extra revenue that Puerto Rico received from a special tax (Act 154) on multinationals operating in Puerto Rico—a tax that is only possible because Puerto Rico is outside of the United States for income tax purposes—wouldn’t last forever. The tax wasn’t exactly something the IRS liked (it is not structured as a tax on income so it isn't obviously creditable against federal income tax). Puerto Rico faced the prospect of losing out in the game of tax competition to other offshore jurisdictions that needed the revenue less, and thus could tax less. Puerto Rico’s debt service burden was poised to rise, thanks to expensive debt that Puerto Rico sold to paper over its fiscal deterioration from 2007 on. Puerto Ricans were voting with their feet and leaving the island to seek better opportunities in the fifty states. The board’s task was to reconfigure Puerto Rico’s budget—and debts—so they were consistent with a shrinking economy. Yes, it was supposed to put forward ideas to help Puerto Rico grow. But its core powers were over the budget. Maria changed everything. The scale of the destruction was mind blowing. Parts of the United States were essentially without power for nearly twelve months. FEMA—and Puerto Rico—need to be better prepared for the next hurricane. But the scale of the destruction—and perhaps a desire to make up for the federal government’s limited initial response—loosed Congress’s purse strings. Puerto Rico received several billion dollars in direct budget support ($4.8 billion in extra Medicaid funding, some extra nutritional funds), and Puerto Ricans received some direct income support. Over the next few years, the Board projects Puerto Rico will receive over $10 billion a year in projected federal aid (see exhibit 8). That’s a lot for a $70 billion economy. Economically, it is manna from heaven—the multiplier on federal spending in a depressed economy is likely to be high. I underestimated the speed with which Puerto Rico’s revenues would recover after Maria. Sales tax receipts were down significantly in the first quarter of calendar 2018 (the second quarter of Puerto Rico’s fiscal year). But they recovered quickly over the course of the spring and have continued to rise. Other sources of revenue over-performed. The gasoline tax for example took in $170 million, more than forecast in fiscal 2018 (see "HTA pass-through" on p. 9). Corporate income tax receipts surged by $275 million as contractors set up shop in Puerto Rico (see section 5.1.1 of the fiscal plan). In the past, many of Puerto Rico’s creditors argued that the key to growth was downsizing Puerto Rico’s government. Yet the current rebound in activity stems not from downsizing government, but rather from upsizing it—the rebound is being driven by new federal spending, not reducing Puerto Rico’s government payroll. In fact, the strength of the rebound is consistent with the broad notion that Puerto Rico’s economy previously was constrained by a lack of demand. I also previously worried the boost from federal disaster would be brief. However, the latest projections imply a fairly constant flow of funds over the next five years, with spending on new infrastructure ramping up as the direct budget support (for Medicaid) is phased out. Disaster spending is expected to peak at $14 billion a yer in fiscal 2020. Not all of that spending will go directly into Puerto Rico's economy; new infrastructure is import-intensive. But, best I can tell, the governor and the board now expect disaster funding to raise the level of GNP by about twenty percentage points relative to baseline. 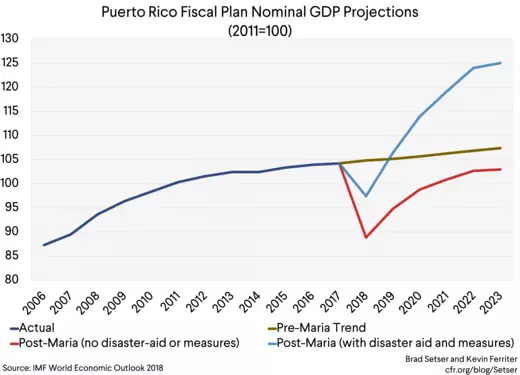 As a result of this forecast, the oversight board now projects Puerto Rico will enjoy a strong five-year recovery, even in the face of substantial (4 percent of GNP, give or take) “local” austerity as spending is cut and there are modest increases in tax collections (see exhibits 83 and 84 of the fiscal plan). I would still quibble with a couple of the assumptions the board makes. I don’t like how the oversight board models the long-run impact of Puerto Rico’s fiscal adjustment for example, as it more or less assumes that fiscal cuts have no long run impact and they naturally fade away. As a result, the level of long-run output is essentially independent of the amount Puerto Rico commits to debt service. But it is a serious forecast, one that makes a real attempt try to quantify the impact of the influx of over $70 billion in federal funds over the next five to ten years. And that there is no doubt that this influx of funds has fundamentally changed the board’s task — to the apparent chagrin of President Trump. Rather than presiding over an economy in decline, with falling revenues, the Oversight Board now looks like it will be overseeing an economy experiencing a brief boom. The board doesn’t have output falling back to its pre-crisis trend after the federal funds expire. But it also isn’t expecting much growth from 2023 to 2030 either. There is a one off jump in output, not a sustained increase in the underlying pace of growth. Yet the near-term boom is substantial. Nominal output and nominal revenues will surge. And since the board hasn’t reduced the amount of adjustment that Puerto Rico needs to do in the near-term, Puerto Rico ends up with a substantial financial surplus in 2023. That financial surplus is forecast to fade over time because the economy slows on the back of reduced federal funding, and because health care costs inexorably rise as Puerto Rico ages. One near certainty over the next twenty to thirty years is a large fall in Puerto Rico’s working age population, as fertility in Puerto Rico is well below the replacement rate. That complex forecast is the source of the risk of a new debt trap—Puerto Rico could find itself locked into a permanently high level of debt on the basis of a temporary surge in its estimated capacity to pay. 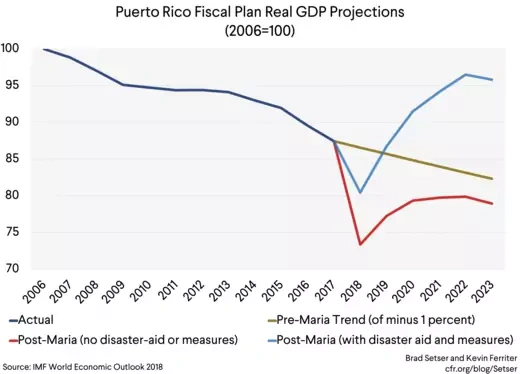 The board’s forecasts show that Puerto Rico can afford to make substantial payments on its debt in the near term, thanks, in effect, to both direct federal budget support for medical spending (in fiscal 2019 and 2020) and to the indirect effects of federal spending (which allow Puerto Rico to make a large fiscal adjustment without any negative impact on output). Puerto Rico’s creditors are sure to argue that with a bit more adjustment Puerto Rico could sustain those payments over time too. But the kind of financing surplus that the board projects implies that Puerto Rico could be left with a debt burden well in excess of any state. The board currently shows a close to $3 billion surplus in fiscal 2022 and 2023 (exhibit 12). Add in another $0.5 billion in payments to the COFINA trust as COFINA payments (on sales-tax backed bonds) have been left out of the budget. That’s potentially up to $3.5 billion for debt service in 2023. The oversight board is arguing that the projected financial surplus in the next few years isn't all for debt service. But if it did go to pay the debt, it would imply payments of well over 20 percent of Puerto Rico’s "own" revenues, generously defined. * By comparison, highly indebted states on average pay 9 percent of their own revenues on debt service. And if the terms of any debt restructuring do not create a debt service path than reduces the debt burden significantly when federal aid falls, Puerto Rico could be locked into a high debt burden while its economy stagnates as federal funds are withdrawn. The financing surplus—and debt service burden—effectively creates a permanent wedge between what Puerto Ricans pay in tax and what they get back from their local government. The high debt burden (measured relative to tax revenue) is something that Puerto Ricans can escape by moving to Florida. Or to Texas. Or pretty much any other state, apart, perhaps, from Connecticut. That’s the sense in which I think the board errs in thinking that the level of austerity—the size of the primary surplus that goes to debt service—has no real impact on long-term growth. The combination of a higher debt service burden than any state and a median income well below that of any state would only work if the high debt service burden was offset by permanent federal transfers. Such (increased) transfers would enable Puerto Rico to pay its legacy debt and maintain an acceptable level of local services. To me, the right thing to do is pretty straightforward. 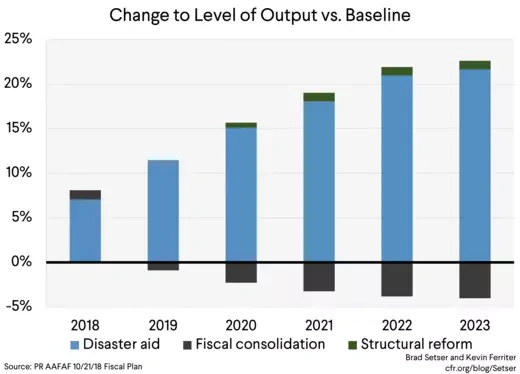 The board needs to set a cap on debt service relative to Puerto Rico's projected revenues, excluding federal aid, and insist that the overall restructuring—including the new COFINA pledge—fits within those parameters. The state average is 4.5 percent of "own" revenues, the average for highly indebted states is 9 percent. That sets out a reasonable range. It would also help to address the growing perception that disaster relief is just providing a boon to bondholders. The COFINA deal already takes well over 5 percent of projected revenues in 2040, so there won’t be a ton available for the general obligation bond holders in this scenario—that’s the consequence of a COFINA deal that pushed debt service over time above that of an average state thanks to an escalating structure of payments, as the new pledge of sales tax revenue goes from just under $500 million to just under $1 billion over the next twenty or so years. If creditors believe that the Board’s revenue assumptions are too pessimistic, they can take a growth bond that provides creditors with a reasonable fraction of any revenue out-performance over time. To sweeten the deal, assuming it is a good deal in the long run, I personally would allow some flexibility in using the current cash position to encourage participation in the deal. That runs a bit contrary to the intent of the federal disaster funding Congress provided. But a bit of flexibility may be the only way to avoid a bigger problem—a future level of debt service that Puerto Rico cannot sustain. * The board believes that about 20 percent of federal spending will remain "on island." Peak disaster spending is around $14 billion in fiscal 2020, so the impulse to Puerto Rico would peak at about $2.8 billion (4 percent of GNP). I would expect the impulse to turn negative from then on. The board though seems to be treating each's year's federal spending as new, so the effect of the disaster spending accumulates rather than fades. To understand the difference, think about two different ways of modeling a federal gift of $3 billion a year for five years. One approach would be to treat its as a one time stimulus of 4.5 percent of GNP (likely with a big multiplier), together with an increase in the capital stock that raises potential output by a bit. That effect then goes away when the spending expires in year six. The other approach treats each year's gift as an incremental impulse to growth. I think the board chose the second approach. As a result it could be over-estimating output after fiscal 20. ** Debt service vs. "own" revenues is a standard metric used to assess the debt of states. It also has the virtue of being independent of the level of federal support. Puerto Rico's revenues net of federal funds can be inferred from exhibits 12 and 13 of fiscal plan. These estimates though leave out the sales tax revenue flowing through the COFINA trust. The debt service numbers in the fiscal plan similarly leave out COFINA, and other key groups of bonds, including the Highway bonds.